Smile Smile Is Arguably The Hottest Band In Town This Week. Buzz is an interesting concept. When a band makes a big show announcement or releases a new track from an upcoming album, it's easy to pinpoint the specific action that got people talking about them that particular week. Other times, a band builds their stock methodically over an extended period to the point where it is hard to identify precisely which of their actions made their stock rise so high in the minds of their fans over that time. In the past few weeks, Smile Smile announced a release date for their upcoming, sophomore full-length, booked a release show at Granada Theater with Jaret and Erik from Bowling for Soup, and, most recently, released a teaser video which gives fans a behind-the-scenes view of the band working on the soon-to-be-released Marry a Stranger. 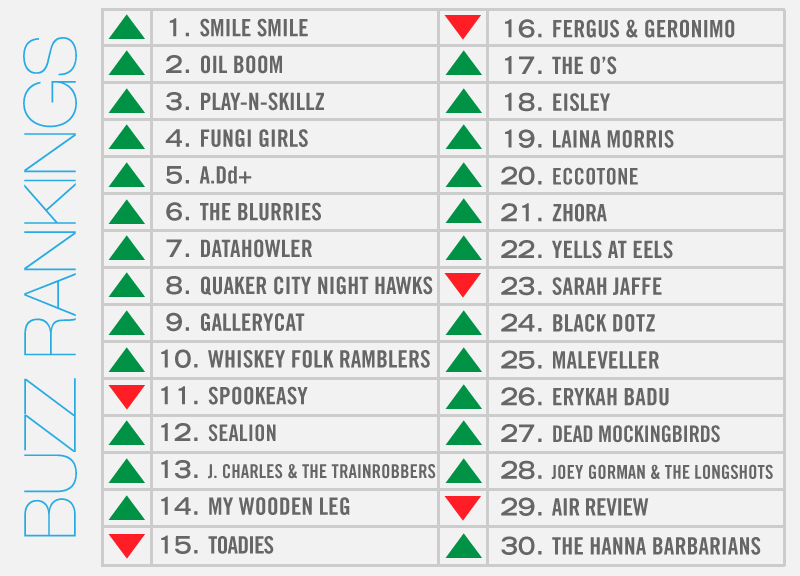 Somehow, that was enough to get the band rolling in our voters' consciousness this week, as Smile Smile takes the top spot on our weekly local music buzz rankings list for the first time. It's their highest placement in our ranking since we launched this feature a little more than five months ago. Along similar lines, Oil Boom's sophomore album release at The Double Wide is still a few weeks out, yet their stake has been on the rise as well. In their case at least, they caught a little boost by participating in DC9 at Night's new “What Are You Listening To?” column earlier in the week. And while people continue to debate whether the Toadies' upcoming release should be considered a “comeback” album or not, the local luminaries continue to be talked about regardless. But album releases aren't the only way to get people discussing your band. Sometimes, all it takes is bringing along a “robot” to your live gig will do the trick as well. The Brothers Salinas unveiled their newest schtick, a dancing robot called Gee-Shock , at their Play-N-Skillz DJ set at Lizard Lounge this week. It also helps when video of the performance makes it online. Just ask Laina Morris, the UNT sophomore who we recently revealed to be the face of the overly-attached girlfriend meme, what kind of power the internet has. She was profiled in the North Texas Daily earlier this week, and, according to that story, now has over 38,000 followers on Twitter. Not bad for someone who was not only anonymous until fairly recently, but who also bases her entire persona on being a creep. Finally, after months of white-knuckle anticipation, D Magazine unveiled the winners of their Best of Big D poll in their most recent issue. Somewhat surprisingly, they named The Blurries the city's Best Music Act, also going on to call them “the most deservingly well-liked band in Dallas.” It's a distinction that's hard to disagree with. We do like us some Blurries.